My WiFi Guard has stopped scanning. It won't scan when I open the program and click on "Scan Now". The blue arrows just turn into a red X and nothing happens. First of all, please check WiFi Guard settings, the Basic tab, and make sure the correct WiFi adapter is selected in the Network adapters list as shown in the example below (your WiFi adapter adapter may have a different name, but it must be selected correctly to enable WiFi Guard to scan your network). 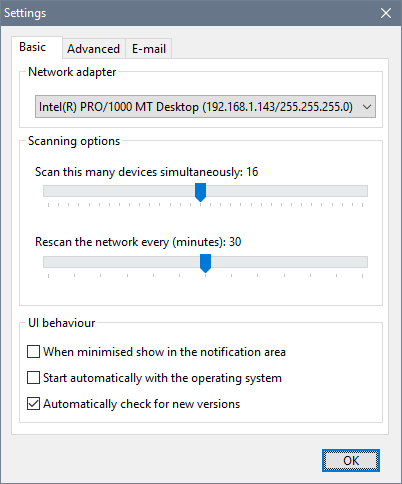 Also please note that network scanning is not instantaneous process: you may need to wait a little bit more before the scan results are displayed.